The palms were swaying and the water of the inner Andaman sea was churning under a strong wind as 33 students from Kiet Pra Cha school in Tapaeyoi village assembled in the cool morning air for a day-long “Young Guides of Koh PhraTong” training. Students’ ages covered a wide range, and English skills and knowledge of the island’s ecology were similarly disparate, but all students brought with them an interest in their island home, bolstered by that playful, bubbly energy inherent in all Thai kids. 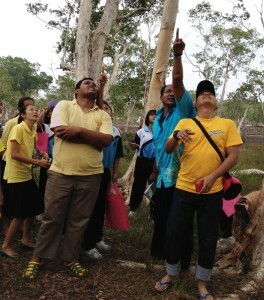 The subject of the training covered the fundamental points of being a local guides. In attendance were most of the school’s students and teachers, several community members, P’ Tui and P’ Bee from Andaman Discoveries. The session kicked off with a short talk by P’ Noon who, in addition to being a superb guide, is well versed in the natural history of PhraTong. P’ Noon is a pillar of community-based tourism and conservation efforts on the island, and his passion for the environment and his community was palpable. 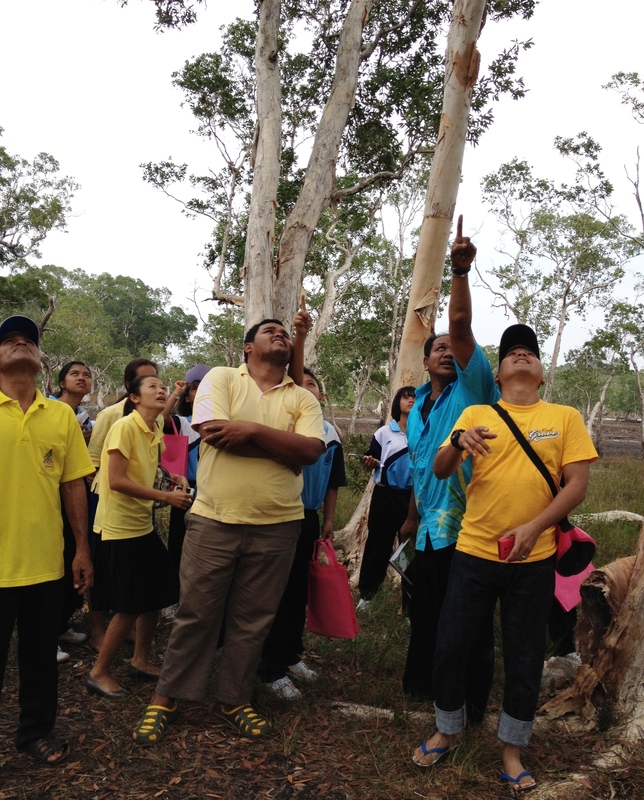 After discussing the importance of conservation and the roles local guides can play in conservation efforts, Nun addressed “SMS – Safety, Meaning, Service,” the core principle that Andaman Discoveries works to instill in all its local guides. Students were then divided into groups and assigned a topic on which they were given an hour to research and prepare a presentation. Most of the groups were researching the island’s various ecosystems – the Paperbark forest, Mangrove forests, etc…, but one group was given the task of presenting on local livelihoods and way of life on the island. It was very interesting to work with this group: to see how they saw their own community, and to try to impart on them how an outsider might see it. This was not a simple recitation of facts, after all, but a subjective look at their local culture from an outside perspective. After the allotted time, presentations were given, questions were answered, and I got to teach about 20 English vocabulary words taken from each group’s topic. The presentation information and English vocab will provide a great foundation for future English lessons and activities. After a delicious lunch, Noon, a few teachers, P’ Bee and Tui, about 15 students, and I, set off on an E-Tek tractor, heading for the Paperbark forest. En route we rendezvoused with a large group of foreign children and adults from PhraTong Nature resort who had bravely agreed to act as test subjects for the young guides. The guides did well, after some very enthusiastic prompting from the western guests, and proved themselves quite adept at picking out orchids and carnivorous plants from the surrounding forest. The group was large and boisterous, and it was not an easy task to get the students or tourists focused on a single point, but the energy was great: cultures were interacting, English was being spoken, and best of all, Thai kids were opening up to unfamiliar foreigners. We soon re-boarded the tractor, vastly over-burdened and under-powered, with people hanging off of every available surface, and made for the savannah. Each bump was greeted with a loud cheer from the Thais and resulting grins from the western guests, and every small hillock or area of deep sand was met with a belch of diesel smoke and the stench of burning rubber as our poor tractor struggled forward. I am sure that there was some sort of educational activity planned for the savannah, but amidst the laughter and conversations in multiple languages, it failed to materialize…mai bpen rai! We made our way back to the main road, replete with smiles and laughter and diesel smoke. There we left our new friends, and headed back to the village. No one became an expert on the Paperbark forest today, and I doubt that more than two or three students could tell me what SMS stands for, but I count this activity as a great success: Cultures interacted. 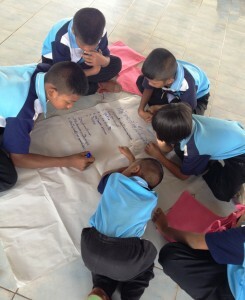 Thai kids overcame their shyness towards westerners – eye contact was even made! The learning of facts and core principles will come later, if these young guides are willing to make the effort. Today’s activity was just the first step of a young generation of island-dwellers towards taking responsibility for their island’s well-being, and sharing it’s wonders, sustainably, with the outside world.